It’s back! Durugan Rap Battle Chapter 7 plus Reality Check Rap Contest this December 11, 2016 or the Elimination Round at Gabriel Compoud, Esso, Pulang Lupa, Las Pinas City. Grand Finals will be this coming December 27, 2016. Showcase your skills, face the competition! Durugan na! Be there! 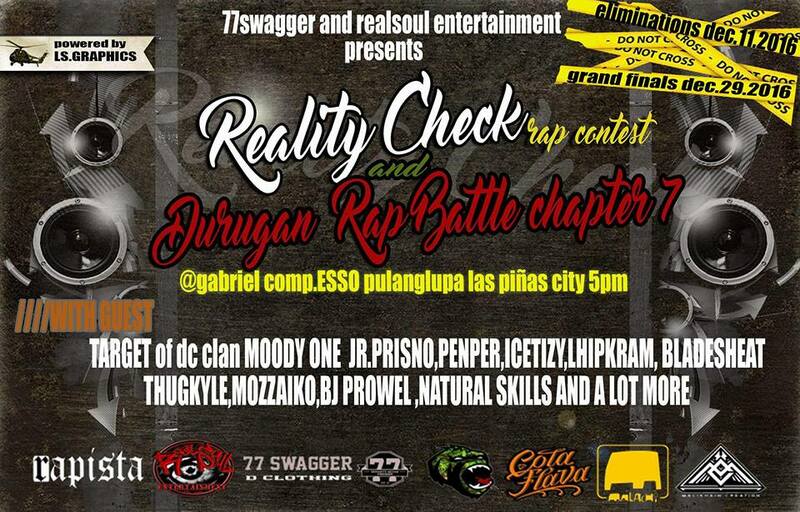 Durugan Rap Battle (Chapter 7) and Reality Check Rap Contest is presented and organized by 77 Swagger and Real Soul Entertainment.